The Statesman can exclusively reveal that the 2008 manifesto of the National democratic Congress is ready and if internal wrangling about its unusual 'audacity' and implementation difficulties can be overcome it should be launched soon, at least in parts. Promising a ‘New Ghana' the NDC manifesto is notably, specifically silent on job creation. Indeed, the word ‘job’ is completely missing from the entire document.The 63-page document is remarkably modest on details but uncharacteristically bold on promises, if compared to the party’s four previous manifestos and numerous national budgets. A member of the NDC Manifesto Committee who spoke to The Statesman yesterday said, "The wider group even finds this manifesto too audacious.”For instance, the NDC intends to use part of an increased military budget to build a “Military Industrial Complex”, for ship building, railways and coaches. Also to be manufactured are light weapons, tanks, drydock, and steel bridges.On the nationally worrying issue of drug smuggling, the NDC’s ‘drug policy’ is curiously skinny. The two-line policy reads: the Narcotics Control Board’s “function shall be upgraded and overhauled to make it more potent to address all its recent shortcomings. Though, the NDC has been actively lobbying Galamseys (unlicensed small-scale miners) to be activists and polling agents, the party’s mining policy is not at all kind to the interests of these local miners. The NDC is fully in support of the status quo. It pledges to provide “a conducive and investment-friendly atmosphere” for mining companies. The manifesto boldly gives notice of the opposition party’s intention to involve government actively in the country’s industrialization efforts.An Atta Mills government shall establish industries "through public/private partnership." Some of the industries to be established include cement production plants, aluminium smelter, gold refinery and ornament production, steel industry, copper, car assembly and manufacturing, manganese and bitumen production plants. The NDC promises that "Ghana’s clothing and textiles and art work industries, as well as artifacts etc. shall be one of the best developed in modern Africa." But, there is disappointment for those expecting clear egalitarian indicators from a party that claims it has metamorphosed in opposition from iconoclastic neo-liberalism to vociferous social democracy. The manifesto gives no promise of continuing with the affordable housing scheme. It favours state-provided housing, but recognizes the mortgage opportunities now provided by a stable macro-economic environment. It says the state would build houses and condominiums to "accommodate the junior rank through to the highest [police] officer," while "mortgage facilities shall cover retired police officers." Ironically, though the NDC has been vehement in its opposition to the NPP LEAP policy of giving free monies to the very needy, their manifesto promises the "setting up of a special mitigation fund." It adds, "A base amount to be determined shall be paid out on a monthly basis to such citizens and not more than three of their children." 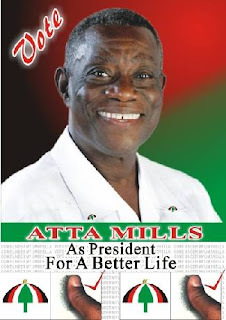 The streets would be rid of "mentally deranged persons" under an Atta Mills government. The NDC would be tough on refuse. Sanitary inspectors "will give spot fines, and or prosecute at sanitary courts." The days of free parking are numbered. "The District shall provide public and street parking which will be tolled or metered." District Assemblies "shall provide helicopters for pest control, local policing, disaster management, ambulance and rescue operation in their jurisdiction." The NDC Manifesto Committee member who spoke to this paper said that those who prepared the 63-page document, including himself, have been "arrogantly presumptive" that it covered every thing. But, it may still go through some changes as it is seen as too ambitious. The document is absolutely silent on how the party intends to finance its manifesto promises.